As your cooperative, we want to be your source of power and information. Since electric vehicles are rapidly becoming more widely available, we hope the following information will help answer any questions you might have. Please feel free to contact us if you have additional questions or need more information about electric vehicles. Electric vehicles (EVs) are a “hot item” in the auto world, with many auto manufacturers offering at least one model. Improved versions are also on the horizon. 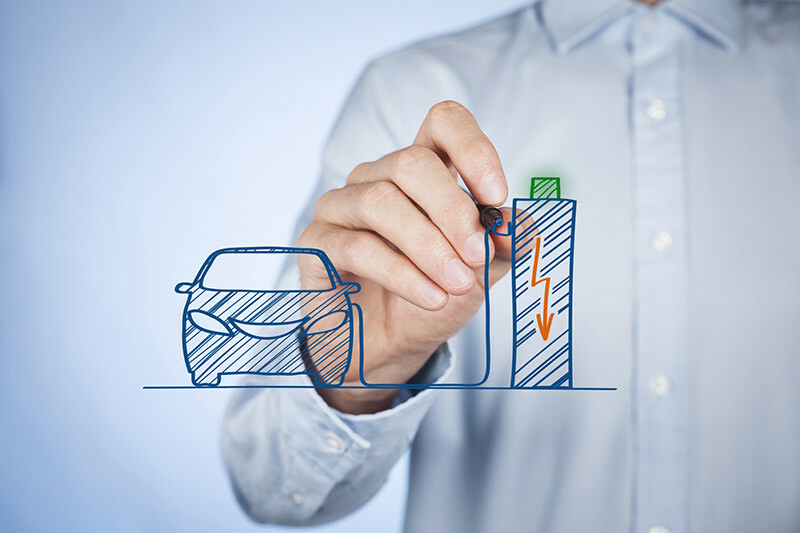 EVs provide environmental advantages and, even though they may carry a higher price tag initially, tax credits and lower operating costs often balance out the initial investment. Is this new technology reliable? Electric powered autos have actually been around for more than a century. In the 1890s, electric cars were more popular than gas-powered autos because of their simplicity, reliability, and low cost of operation. In fact, Henry Ford’s wife drove an EV. For a variety of reasons, EV technology languished with the rise of gas-powered engines, but today, EVs —once again—are finding their place across America. This renew popularity is fueled by significant advancements in power electronics and energy storage technologies. What do all the different terms mean? All of us are most familiar with conventional combustion-engine vehicle terminology but with a changing market it can be hard to keep up with the newest technology terms and models. For simplicity, we’ve separated the options into four basic types of vehicles. Below you will find a list that indicates what fuels each type of vehicle and how they operate. Conventional vehicles have an internal combustion engine; the most common fuels are gasoline and diesel. Hybrid vehicles have both a gasoline engine and an electric motor and battery; both gas and electricity power the wheels. The electric motor and battery are designed to improve fuel economy, so less gasoline is used to operate the vehicle. The battery is charged solely by operating the vehicle; no plug-in is required or possible. Plug-in Hybrid Electric Vehicles (PHEVs) have larger batteries than hybrids and use both gas and electricity to power the wheels of the car. These vehicles vary in their electric range, but shift to gasoline-only operation when battery power is depleted. These vehicles must be plugged in to recharge the battery. Battery Electric Vehicles (BEVs) are powered solely by electricity and are recharged by plugging in the vehicle. What is the cost to own and operate an EV vs. a gas-powered conventional vehicle? It’s hard to compare true costs when we’re not comparing apples to apples. While battery electric vehicles and plug-in hybrid electric vehicles may have a higher purchase price, lower operating costs and incentives can partially offset the purchase price. As an example simply for this comparison, the annual energy costs and savings for owning electric vehicles compared to gas-powered vehicles use assumptions that include driving the vehicle 15,000 miles a year, with 225 days of 50 miles each, and 50 days of 75 miles each. Also, U.S. Energy Information Agency numbers were used for EPA fuel economy numbers and average costs of energy. Comparison method 1: EV vs hypothetical gas-powered vehicle that gets 25 mpg. A typical BEV would save $730 in annual energy costs per year; electricity costs would be less than half the cost fuel for the gas-powered vehicle. A typical PHEV would save $600 per year when combining the cost of gas plus the cost of electricity to operate the vehicle. Tax credit. Most BEVs at the time this article is written receive a $7,500 credit, while PHEVs generally get somewhat less. The credit may be based on the battery size. Note that the battery installed in hybrid vehicles may be too small to qualify for a tax credit. Other incentives. Some states and cities have additional credits or perks for electric vehicles. PHEVs are more complex, with have both gas and electric components, but some maintenance costs can be lower. For example, regenerative braking leads to less wear on the brake system. These sources of information may help as you explore options for the purchase or lease of a BEV, PHEV or hybrid. Consumer Reports has several articles about electric vehicles. Green Car Reports published an article defining the various types of electric vehicles. Plugincars.com provides a list of electrically powered cars, along with pricing and other details. For Tesla charging network options only, see Tesla’s guide.